Celebrate the Season by Making Paw Prints! You don’t have to be Martha Stewart to make an ornament that’s worthy of hanging on a Christmas tree or giving is a gift. 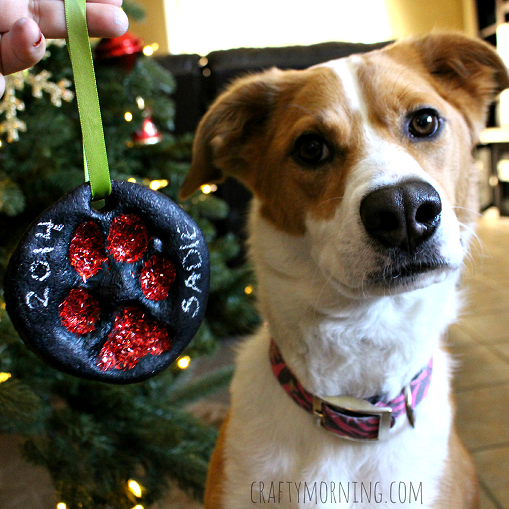 One of our favorite ways to trim our Christmas tree is with paw print ornaments. Whether you have a new puppy in the house or a beloved old companion, this simple decoration will capture the holiday season and become a timeless treasure for years to come. And, thanks to these simple instructions from Crafty Morning, making one couldn’t get easier! Optional: paints, markers, or glitter to decorate! Combine the flour, salt, and water. Knead the mixture until it turns into a smooth dough. Using your hands or a rolling pin, flatten the dough until it’s approximately 1/4 inch thick. Cut the dough into fun shapes using a pizza cutter, drinking glass, or your favorite cookie cutter – just make sure it’s large enough to fit your dog’s paw. Put your dough shape on a plate, aluminum foil, or parchment paper. Place it on the floor and gently press your dog’s paw into the dough. Use your pen, straw, or toothpick to make a small hole at the top. Bake in a 200° oven for 1-2 hours. When your ornament is completely cool, add your dog’s name and the year, and thread yarn or ribbon through the hole so you can hang it on your tree! For more decorating inspiration, watch Crafty Morning’s instructional video!